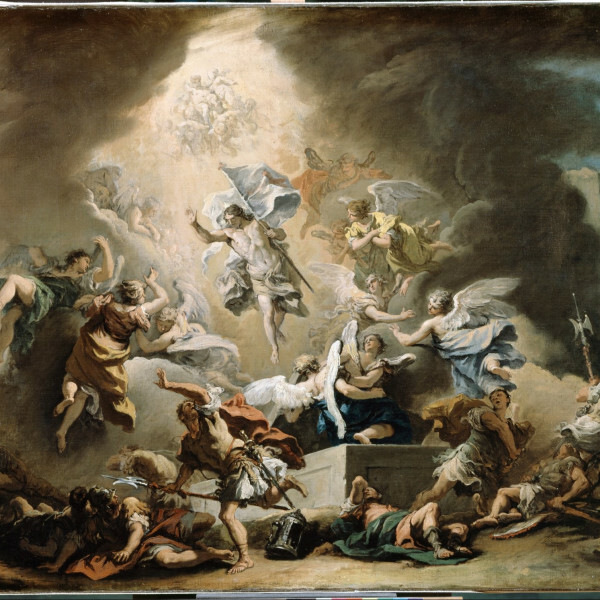 The hardest thing to believe in the New Testament isn’t that a guy rose from the dead. For the disciples, the hardest thing to believe was that they were going to come to possess the Roman Empire, and build a new civilization, and it was all going to happen by giving themselves up for dead. Those few dozen people, barely holding it together, were going to build a new world order, and they were going to do this without weapons, without military strategy, without intrigue, without political power. They would have to be willing to practice peace in the face of torture and incredible violence, and doing so would somehow secure their victory. They could hardly imagine such a thing. The meek would inherit the earth. That is the hardest thing to believe in the New Testament. It took a guy rising from the dead to convince the disciples of it. It took him appearing to them again and again to give them the courage to think it might be true. Looking back, we’re in a very different boat. We know that Jesus was right. We know that the meek did inherit the earth. We know that those few dozen people did go on to build a new world, without a single military conquest. And this gives us pause — it makes us look again at the event that convinced them. It’s almost unimaginable to think that a guy might have risen from the dead — but at least we’re not them, trying to convince ourselves that the Roman Empire was going to fall before a group of people who never even lifted a sword. Jesus is the ideal and the disciples are our proxy in the story of his life. Here are a group of people so wonderfully and humanly flawed that we can empathize with and see a bit of ourselves in them. Despite these flaws they still attempt to practice the ideals of Christ. This generally is a good idea, even for non-believers like me. I think it's no coincidence that the most difficult task the disciples ever faced was after Christ's death. It's very symbolic of how our own challenges in life are most difficult once we're on our own without the instruction of our teacher(s). So the story of the disciples' peaceful actions during the downfall of the Roman Empire is supposed to illustrate how we should approach such hardships. It shows how painful and difficult it is to bear such hardships on your own. Therefore Jesus' reappearance and reassurance is supposed to be symbolic of god's continuous presence with us during these times of hardship. I imagine the hope of this story, regardless of origin, is to imbue the reader with confidence to persevere armed with the belief god is with them to helps just as Jesus was with the disciples. Make yourself meek and you will be rewarded. Except meek is a moving target. To quote Dan le Sac; "Religion became a tool, for the weak to control the strong. With all these morals and ethics, survival of the fittest was gone. No longer could the biggest man simply take whatever he needed 'cause damnation was the price if certain rules were not heeded." Religion isn't the only thing that made the meek strong; all the IT advances throughout history and other tools that enhance mental capacity have added to it as well. I'd hazard to guess it's cyclical and accelerating with our tools. Look at the last century. Arguably the meek in "modern" times were the nerds and geeks, and now they're "superstars" influencing every facet of life. The meek have inherited the Earth, but now what? Are they still meek? Perhaps the meek are whoever is disadvantaged by the system? It seems to me the predominant power system now is money/class, and the nerds & geeks are privilege to it now. This is why I see the Occupy movement being very similar to the efforts of the disciples. Here is a group of the meek hoping for the empire to fall by non-violent means. I think any conclusions drawn will be more a result of personal beliefs than fact (sigh... aren't they all...), but there are parallels to be seen. This has my mind going a thousand different directions. :) I'll tackle this one: I think you're right to compare the rise of the nerds and geeks to the meek inhering the earth. That's exactly what happened, and the real question is, once they've inherited the earth, what next? The answer, of course, is that there's a new locus of "meek" and "strong". A new underdog and "overdog". And I think this is a continual process, a process where the edge keeps moving towards the center. Another way to say that is "the last will be first". And another way to say *that* is to say: change is constant. But which direction is the change? Who is moving from the periphery to the center? I think the answer is that this motion is always to elevate creative energy. The nerds had more creative energy than the people who bullied them. The disciples had more creative energy than the Roman Empire. And what I imagine happens is that as soon as the people in the center begin relying on their relative strength, ie, their position in this system, then the very thing that drove them there will drive them out. Conversely, it is precisely the meekness of the disciples and the nerds -- their inability or unwillingness to operate out of the strength of position -- that cast them back on their inner reserves, tapped into their creative energy, and propelled them towards the center. This is really the significance of ancient Israel, as well. They were pretty much never on top. They originated as a band of gypsies, grew up to be bullied by all their neighbors, and basically never won a battle except through being really clever. Their founding stories are basically about how they were always the underdog. BUT...this drove them to do things others didn't do. The depth of their literature is profound. Their focus on education was unmatched. And ultimately, they created a culture that reshaped the world.